there is some bug within the frontline... it doesn't let me start, and in the garage it writes episode 4 will start in 27 days... WHY? I like the T-34-3, it is one of my most played tanks but I don't think that it is ideal for frontlines. It is dominated by progettos and it's not fast nor accurate enough for the bigger map. LIKE ALWAYS. working as intended. Aye! Still not working. Posted in the ''Frontline Season 3'' thread as well. Typo perhaps and they meant to start 10:00 when the American Challenge ends? The only tank I ever traded in during the trade-in event, for the WZ-120-1G-FT. Best decision ever. Even after the buff I still couldnt make this thing work for me. since when the mediums and tds ended up costing as much as heavy tanks? 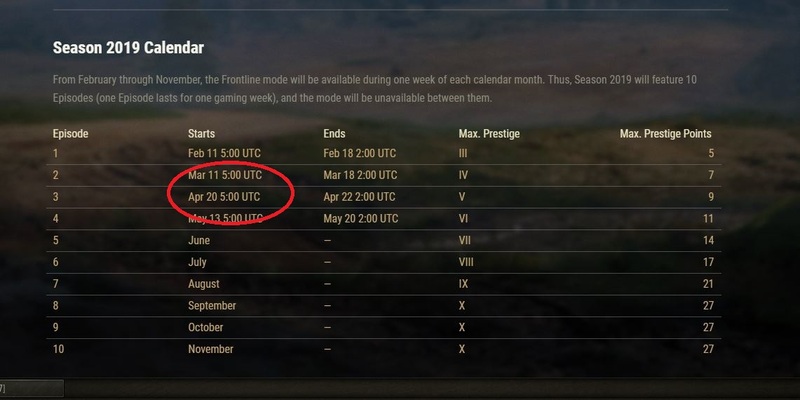 Frontline again not working ???????? A 50-50 coin flip of penning the LFP with HEAT. Is the Caernarvon Action X with BoA, or what does the "100% trained Crew" mean? the other tanks only have "100% Crew"
The BiA crews are only included during the marathon, "100% trained Crew" means trained for the CAX, 100% major qualification, no skills. Edited by Asklepi0s, 15 April 2019 - 09:29 AM.